Like nearly all my figure reviews, this one is really late, which is a shame because there are already quite a few reviews of this particular figma incarnation of the digital diva. Things kept coming up, time kept getting short, but dammit I’d already decided to review her so review her I shall. So here we go, figma’s milestone 200th product, also known as ‘Miku figma 2013’. 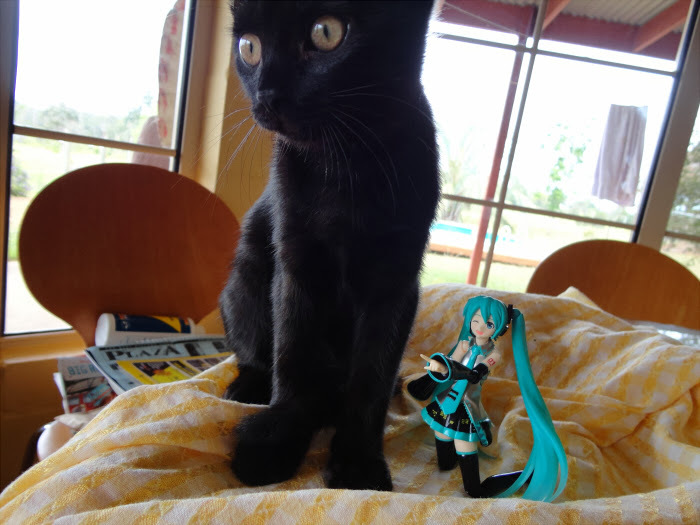 Oh Miku, how you’ve grown. 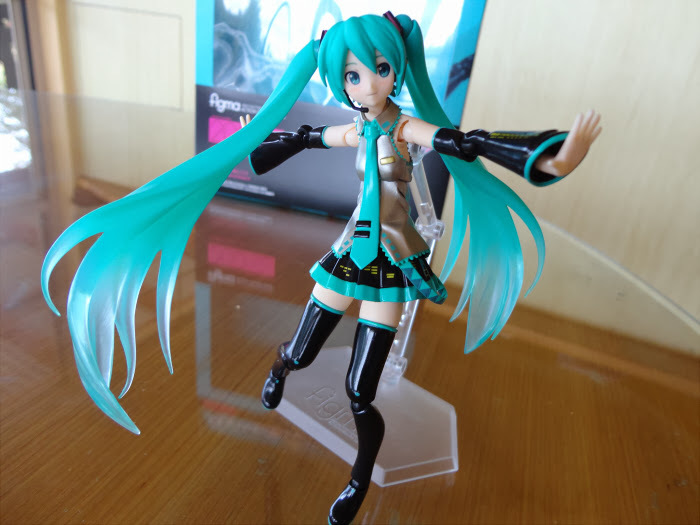 Some people have questioned the reasons for there being another Miku figma when Max Factory already released one years ago (I even reviewed it), and I’ve even seen some pretty ignorant reviews that not only called this one ‘pointless’, but stated that there is little difference between it and the original. 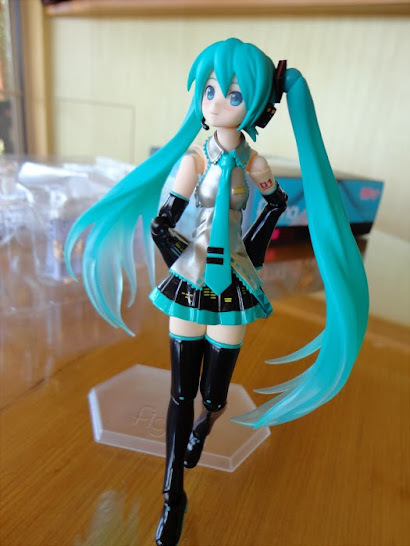 Which is absolutely false, and while there are plenty of people who can give a more in-depth list of every way this Miku differs from ye olde figma Miku, I still want to compare them a little just to begin. 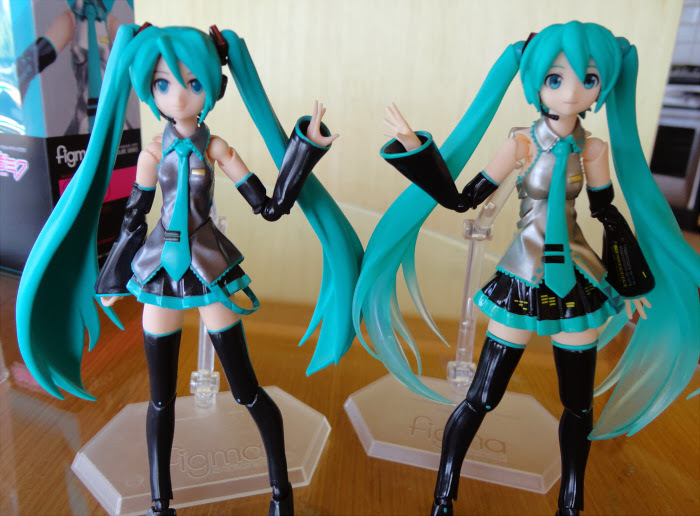 Ye olde Miku on the left there is starting to look dated, no? So with that obligatory comparisson out of the way, let’s look at what comes with the package. Not included in this photo are the usual set of optional hands, the stand, and some angel wings we’ll look at later. 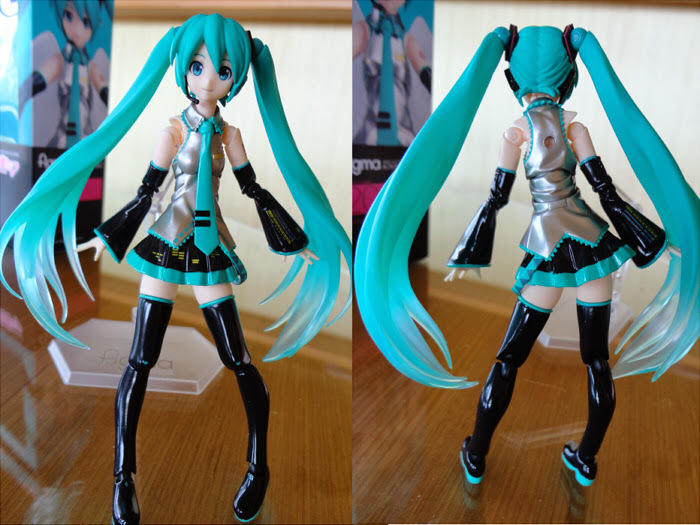 Like ye olde Miku, Miku 2.0 can kind of stand without the figma stand, mostly because her twintails keep her balanced. You can see what I meant by the improvement in her posture; the construction of the body joints has been revamped entirely. She has a joint in the middle of her torso that’s covered by her clothing – a soft plastic that can move with the joint – and the joint itself is so secure that I don’t even know if its possible to pop it out. Considering the nightmare of ye olde Miku’s faulty torso joint that concluded with me supergluing her together, this is very welcome. I said that its ‘possible’ to stand her without the stand, I never said the balancing pose looked particularly good, but here yo go. Appearance-wise, the only possible complaint I have is that her arm joints can look a bit weird, as do her shoulders…although this is a problem that all poseable figures have. Sometimes you just have to sacrifice some aesthetics for poseability, and the problem is a lot more apparent when the shoulders are bare and not ‘clothed’. 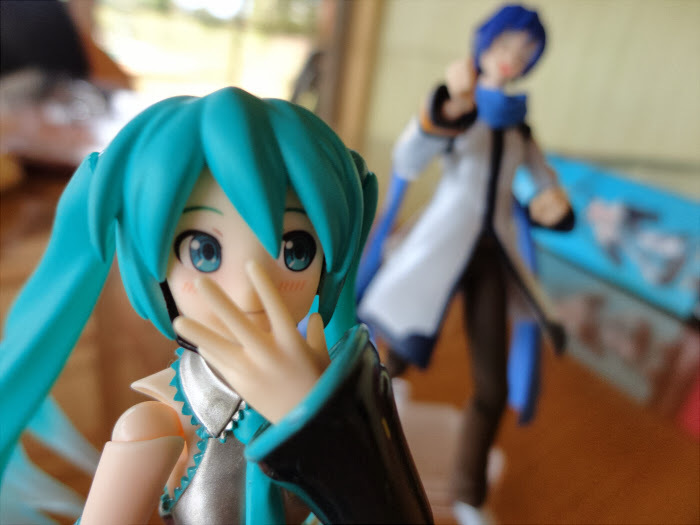 There are a few things Max Factory seems to be quite proud of with this release, and Miku’s ability to ‘sit’ is one of those. 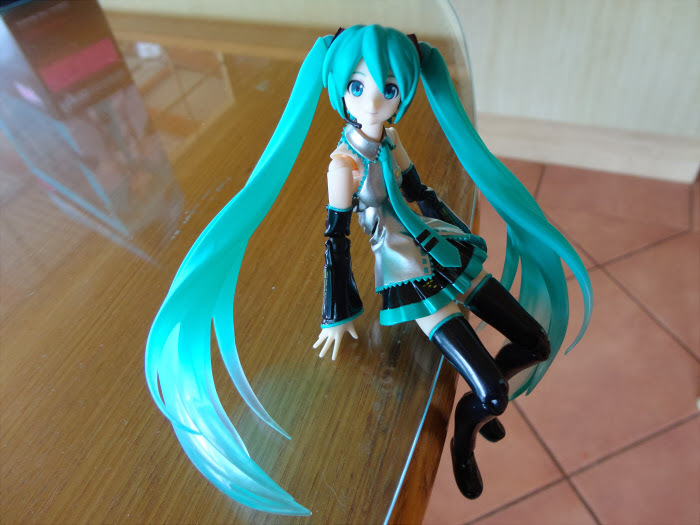 The increased versatality of her torso joint does mean that its easier to put her in a sitting position on the edge of something like this… although it’s still not perfect, and it tends to only look good in a photo if you take it from a high angle. 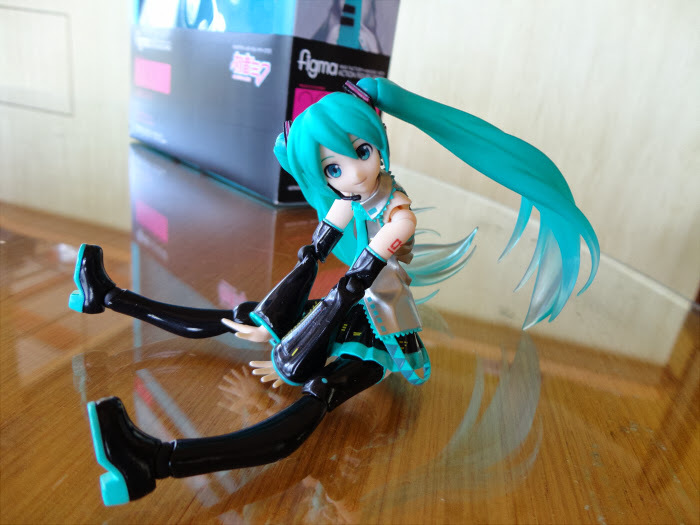 They were also pretty proud of how Miku can sit in this pose – Miku 2.0 even comes with these special ‘flat’ hands for it. (You can see them under the guitar in the picture of the box’s contents). I really don’t think this is a particularly good pose though; not only does it very barely work (note the gap that appears in the soft plastic on her top like some kind of silver pacman mouth, not to mention there’s not really any way her hair can sit naturally without getting in the way), the flat hands don’t really sit nicely on the surface you put her on. It’s way more trouble than it’s worth. But it does look a good deal better from a high angle . It generally works better with the ‘shy face’, too. However, I think that the ‘flat’ hands aren’t limited to this pose alone. I played around with them to see what else I can do with them. So about that ‘shy smile face’…isn’t it adorable? It’s pretty versatile in what kind of expression you want to convey, depending on the pose. I think I like it the best of the three faces she was given. Much more personality than a vacant stare! 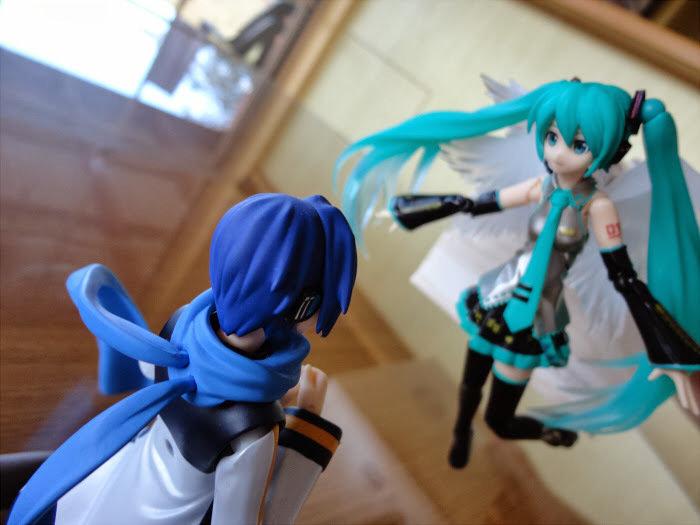 Do you have a secret, Miku? 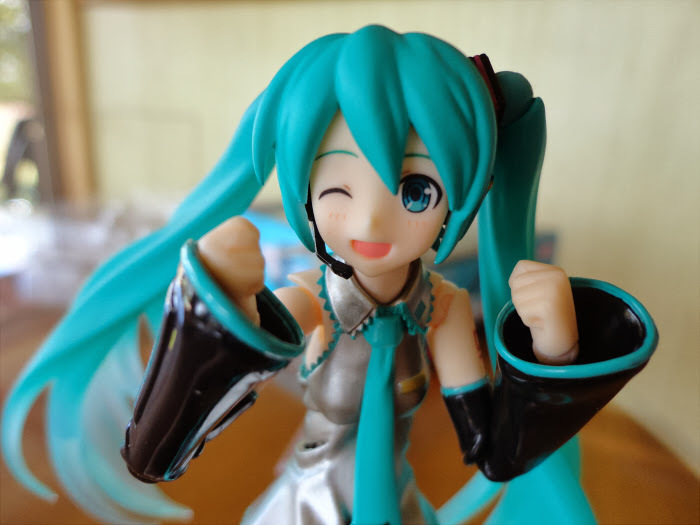 The next face is a happier, open-mouthed-while-winking face, which is also very cute, as well as again having more personality than just the ‘open happy mouth’ of ye olde Miku. It’s really good for more energetic, happy-go-lucky moods. I guess the only drawback is that she doesn’t look as much like she’s singing as the old open-mouthed face did. But the happiness is infectious. Special-guest appearance from my cat Inka. It’s this face that works best with one of the other bonuses included; a guitar. 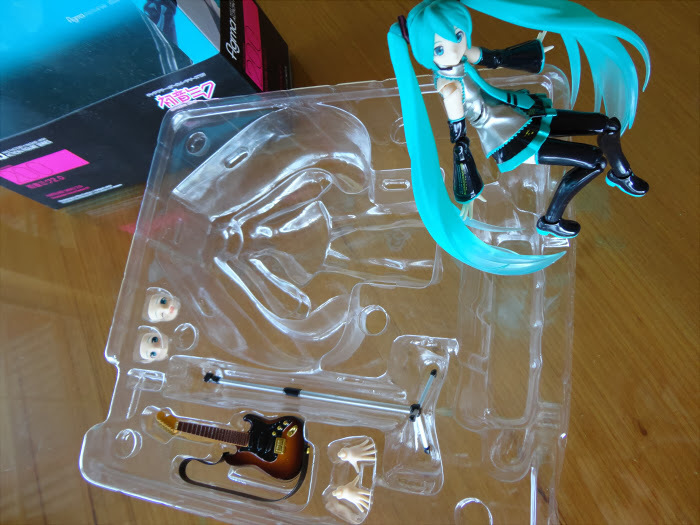 To be honest, this guitar is a little puzzling to me because Miku isn’t exactly well-known for playing them, even if the idea is cute. There’s also special guitar hands you can use; one to use for holding the neck and one holding a guitar pick. Something worth mentioning here is that in order to get the guitar on, you have to pull it up from the bottom, over her legs. In any other figma with such obstructive hair, you would have just taken off the figma’s head, put the guitar strap over the shoulders, then replaced the head. 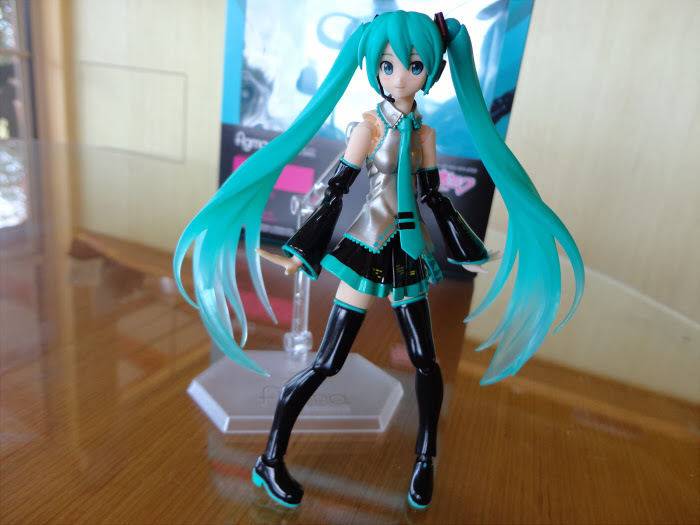 But the thing is…Miku 2.0’s head can’t be removed. This is an even bigger mystery to me than the inclusion of the guitar – head-swapping on figmas and nendoroids alike has always been a lot of fun, but its impossible with this Miku. Why? 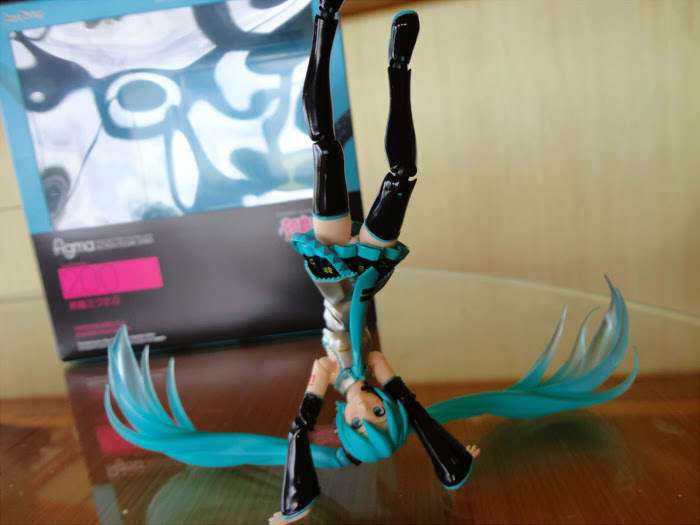 It’s not a new figma-making decision – figmas that came out after Miku 2.0 are able to have their heads removed. Max Factory must have realized that a lot of people would try to pull her head off anyway and risk breaking her, so included instructions on how to equip her guitar and that the head is irremovable. I’m never going to understand the reason you can’t remove her head, I would have loved to put her in different ‘outfits’ with different figma bodies, so this is in my opinion the greatest drawback. And on top of all of that the guitar doesn’t even look that good so I really don’t understand why it was included at all. 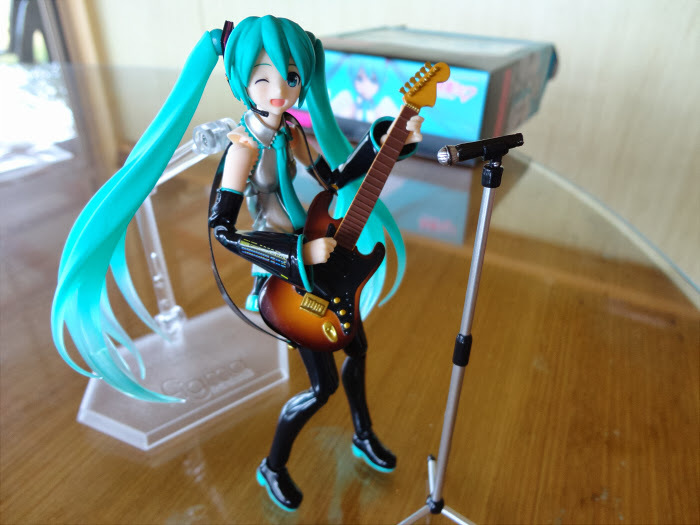 Definitely not the best figma guitar. Not even the strings are painted! Come on, MaxFac. 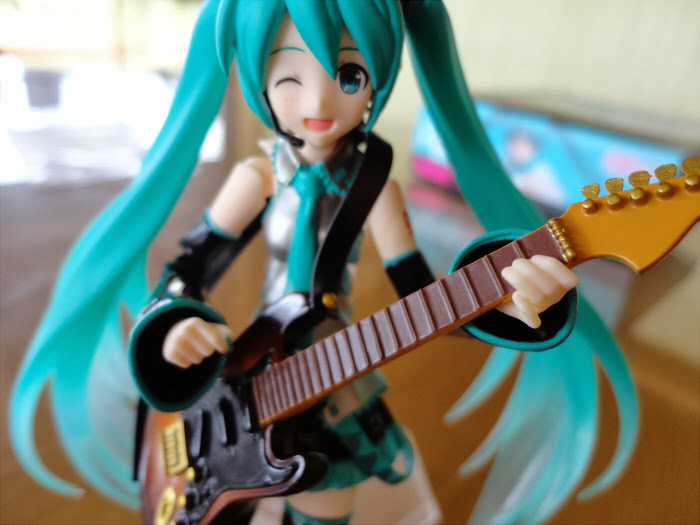 In the end I just decided to ignore the guitar because I don’t really think it adds anything other than make me wonder when Miku became a guitarist. Some people complained that there was a guitar instead of the trademark leeks, but to be honest I don’t really care about leeks. 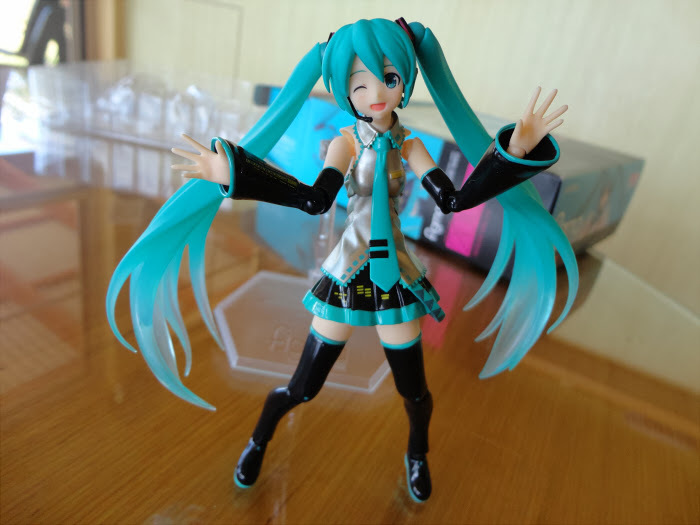 Just about every poseable Miku figure comes with damn leeks. I’d be a little sad if the guitar I don’t care about was the only main extra to the figure, but luckily there’s another that’s more interesting. The angel wings! 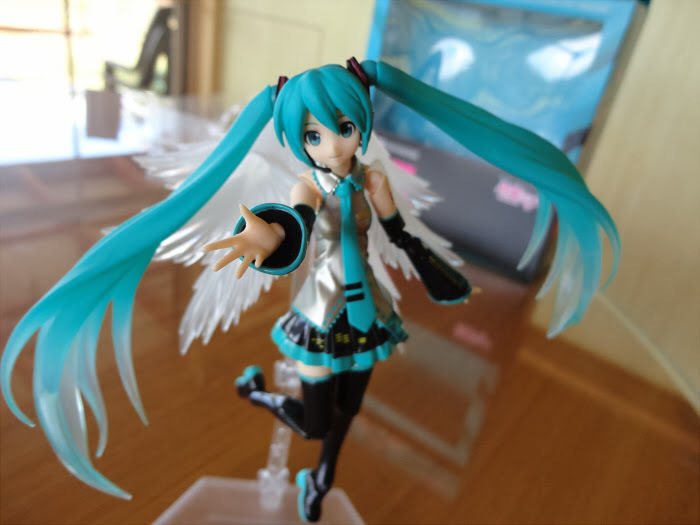 Miku has been portrayed as an angel of sorts many times before, both symbolically and literally, so the wings make a fun extra that you can also use on any other figma you want to turn celestial. 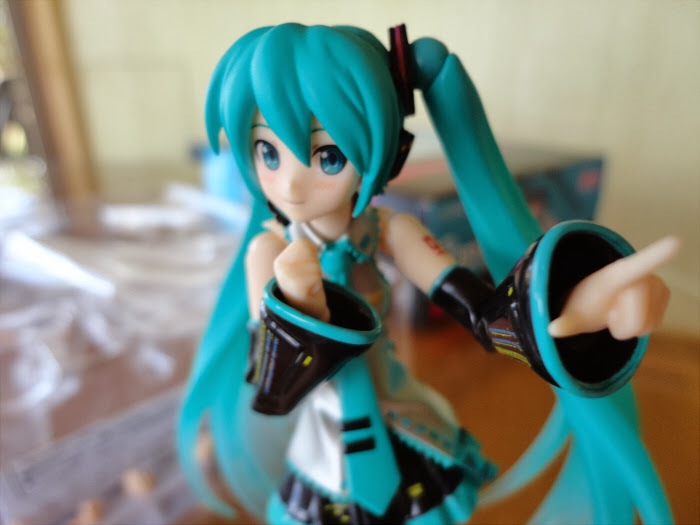 They work by attaching to the peg of the figma stand…which, sadly, does bring me to one of the problems Miku 2.0 has. The peg in her stand doesn’t fit the hole in her back that well, and its really far too lose….a complaint you may recognize from ‘almost every figma review ever’, and something I can not believe Max Factory are still battling with at their 200th release. Adding the angel wings makes the peg even harder to keep in her back, but if you’re able to get it in it really does look cool. Airborne poses can be tricky but help a lot with the overall look. 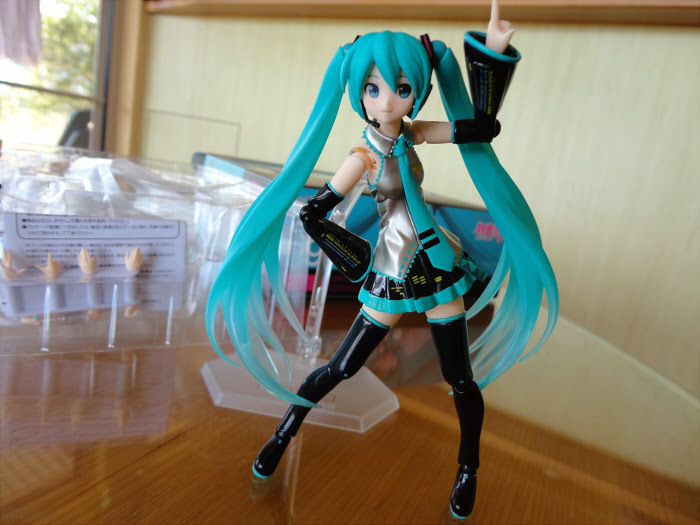 Overall, Miku 2.0 is a beautiful figma with some great poseability and a whole load of personality, unfortunately marred a little by some questionable design choices and Max Factory’s all-too-usual shoddy figma stand. 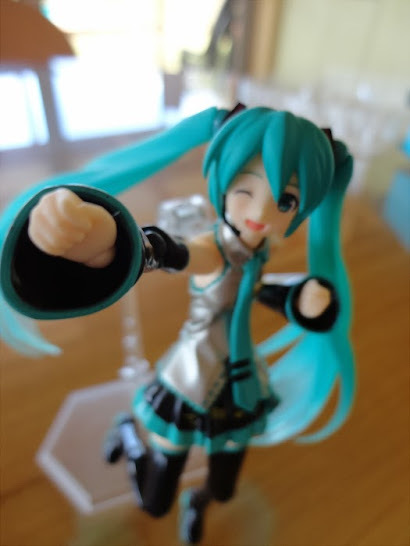 However, the issues she has are a lot less troubling than the problems ye olde Miku has (at least she doesn’t fall apart if you breathe too hard), and the good definitely outweighs the bad. 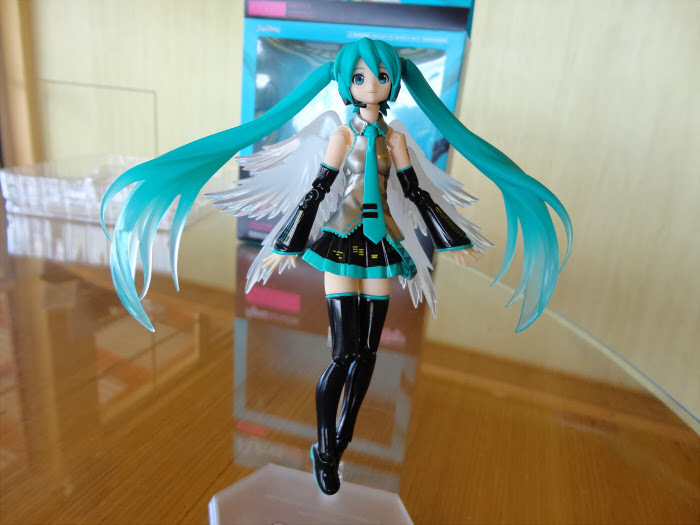 I don’t think it needs repeating that if you’re a Miku fan you should definitely try to get one, whether you have the original Miku figma or not. She’s still up on amiami while stocks last. ‘…and the angel did say Go Forth, and spread blessings of techno music’. Reblogged this on ✎ Welcome to airjyp's.